It’s been a fun week in our house… Well apart from the teething (still no teeth!). On Saturday we went for a lovely walk along the brook and also to the swing park. Great fun, with lots of duck watching, along with chickens and cows! We met lovely friends for lunch on Bank Holiday Monday. Lunch lasted 3.5 hours and H had a blast! She loves a highchair (well any highchair apart from her own), and the fact she gets to watch all the people round about is just the best thing ever in her boat. So, although we missed out on 3 hours packing, let’s face it we would have had at least half an hour off, and we went home with a sleeping baby and renewed packing momentum! A moving deadline and a list of packing aims never hurt anyone hehehe! H’s swimming lessons started again this week. She’s on term 3 and absolutely loves it. She swims away, splashes, kicks, grabs the side, and generally has a fabulous time. I know some people don’t agree with putting little ones under the water, but H knows how to grab onto the side… sometimes while swimming her through the water we grind to a halt, of course she’s only decided it’s holding on time! …. Ooops swimming pile up! She also sits on the side, ‘falls in’, turns around and holds on. How anyone can fault a class that teaches a little one such basic safety is beyond me. We had some moving issues this week, but luckily a cup of tea at a friends house proved a fantastic idea! H was in a fab mood which really helped, happy playing and reading her books. We had a couple of ‘home’ days, and as it’s still school holidays there was no bounce and rhyme at the library. So instead we played and read at home and went for walks in the pushchair (thank you snoozeshade for getting H those all important naps). H decided this was the week she wanted to start practicing walking across the living room (holding mummy’s hands)! ? It wasn’t all fun and good moods, we did have a few ‘testing days’. Thursday was definitely one of them. H was obsessed with walking and was in a needy mood. Lunch with a few friends helped and also provided her with the change of scenery she craved ? We do think her teeth feel much more pronounced now, so it might have been teeth irritation, poor girl. Well, that’s been my week, and reading it back I can definitely see tea and lunch were a big part! I’ve missed out the boring time we spent packing! What a lovely week, it’s so nice to look back sometimes and reflect of what you have done/achieved! I really enjoy having a sneak peek into other people’s lives too! 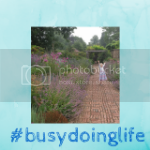 Thankyou so much for sharing this with me on #busydoinglife I love that you are becoming a regular linker, it’s so great to have you! Sounds like a lovely week. Thanks for sharing at Busy Doing Life Linky! Erin @ Nourishing My Scholar on Toddler puzzles: Orchard Toys Once Upon A Time puzzle?